Pictured is one of sculptress Marika Bordes’ sculptures that will be on display at the Seguin Heritage Museum this weekend. Each sculpture also includes reflections on the piece by community members. Below is Audra Schulz’s reflections on the pictured piece. Personally, I don’t remember ever inciting such a reaction in my mother. I cannot imagine an enterprise of my childhood creation stirring such frustration in her. Marika! Surely your inspiration is an exaggeration! A child of free spirit myself, I am quite certain that if one ever did see my mother in this pose they most certainly mistook exasperation for revelation. Revelation that she had bore a child of such resourcefulness that she felt swept away with the pride of it! Marika, this is your true inspiration, isn’t it? Pride that overtakes your heart upon the vision of her! Pride that you took part in the creation of someone who can make you all at once infuriated and swollen with delight at your accomplishment! In addition to the works of art, Bordes says her sculptures will also include commentary and reflections by community members. Museum Director John Gesick says the museum will be filled with over 30 sculptures from Bordes and her talented students. 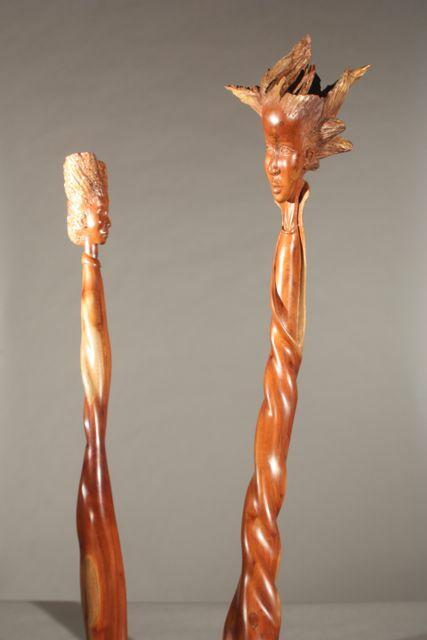 The Heritage Museum chose to host the sculpture exhibit, according to Gesick, because art also plays an important role in the history and culture of a people. The free reception will be held from 6 to 8 p.m. Saturday at the Seguin Heritage Museum, which is located at 114 N. River St. just a block north of the Guadalupe County Courthouse. This entry was posted in Sculpture Exhibition, Seguin Art and tagged audra schulz, john gesick, Seguin Heritage Museum, wood sculpture exhibition. Bookmark the permalink.